I ordered a new boat to be built back east and wanted a quality aluminum trailer so we could transport the boat up and down the west coast and into Mexico without worry. After much research, I decided to go with the West Coast ABT trailer manufactured in San Bernardino and haven’t regretted that decision for a minute. When the boat was completed a week early and I had to have my trailer build expedited, Alex put everything else aside and stepped up to the plate and delivered it the day the boat arrived! The trailer was set up exactly how it needed to be to accept the boat. Alex did a great job; he built the trailer from the boat manufacturers specs with a couple of phone calls and emails to the factory. The trailer bunks fit exactly to the hull. We drove the boat directly from the dealer, right onto the trailer and didn’t have to make one adjustment. After I picked up the trailer from the shop and took it to San Diego you wouldn’t believe how many compliments I got on the trailer! 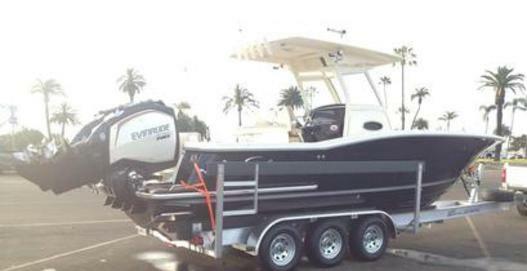 I would recommend ABT trailers to anyone who is looking for a quality, dependable boat trailer that also looks great. Alex builds a great trailer and is very customer service oriented, Lorraine handled all of the paperwork professionally and she is always a pleasure to speak with.